BELLEVILLE — The Hastings-Prince Edward United Way is honouring Belleville millionaire and philanthropist Maurice Rollins for a decade of major support. 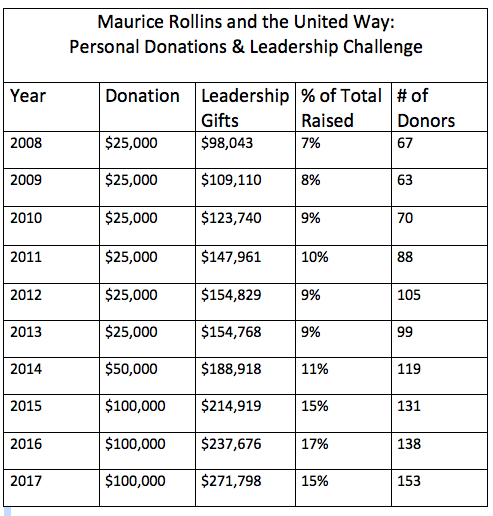 For 10 years Rollins has supported the United Way with his personal donations and though the Maurice Rollins Leadership Challenge. The challenge encourages community members to donate, with Rollins matching donations over $1,200 dollar for dollar. In the 10 years, Rollins has donated over $600,000 of his own money and brought in over $1.7 million thought the challenge. The number of leadership donors has more then doubled – from 67 to 153 – since 2008, when Rollins started the challenge. The United Way will plant a red oak tree in Rollins’s name on the Waterfront Trail later this year. Last year Rollins received Ontario Medal for Good Citizenship for his support of many charities and non-profits.